While other mortgage programs are constantly changing their rules in order to attract more consumers, the VA loan program is able to remain consistent. Why? Because from the start, the program was designed as a military personnel benefit that helps eligible veterans attain the dream of homeownership. With this in mind, it is important that these home buyers not overlook the best benefits of a VA loan. VA mortgage rates are usually a little lower than conventional interest rates. Since the VA guaranty to lenders is an important part of the program and the VA does not set the interest rates, VA lenders are able to be very competitive when setting their VA rates. 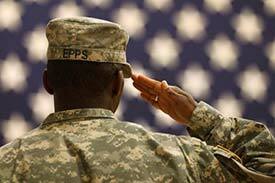 This gives veterans the upper hand to shop around for the best rate being offered. All mortgage programs have a minimum credit score that is acceptable for an approved loan. VA loans do not have a minimum. However, lenders do have overlays (their own guidelines) on VA loans that usually have a minimum credit score. Again, since this can vary from lender to lender, borrowers can shop around if they are working with a low credit score. VA lenders who specialize in VA loans will usually be better suited to accept a variety of credit scores. While other mortgage programs change their down payment requirements depending on market conditions, the VA loan program remains consistent and does not require a down payment. Only when the purchase price exceeds the appraised value of the property will a down payment be necessary. VA loans do not require private mortgage insurance even though no down payment is necessary. Other mortgage programs require PMI when the loan is more than 80% of the home’s appraised value. Closing costs for most mortgage programs can be a significant out of pocket expense for home buyers. However, the VA protects its’ borrowers by putting limits on the allowable closing costs in order to reduce the financial burden to their veterans. When working with a knowledgeable VA lender, borrowers often will have no out of pocket expenses at closing. VA benefits don’t stop after the initial closing. The VA has made it possible for its’ borrowers to refinance to a better VA mortgage without the need of documentation, appraisal or credit qualifying. The easy Interest Rate Reduction Refinance Loan (IRRRL) is a simple VA to VA refinance that removes the steps that are usually required for a refinance. VA loans remain a vital part of the benefits offered to those who have served our country. At this time, the use of this program continues to hit records levels; guaranteeing the 21 millionth loan in 2014. As other mortgage programs struggle to attract consumers, the VA loan program has continued to draw in and help those who are eligible without the need to make changes to the program. Feel free at any time to contact us for more information about credit history, credit reports and credit scores.